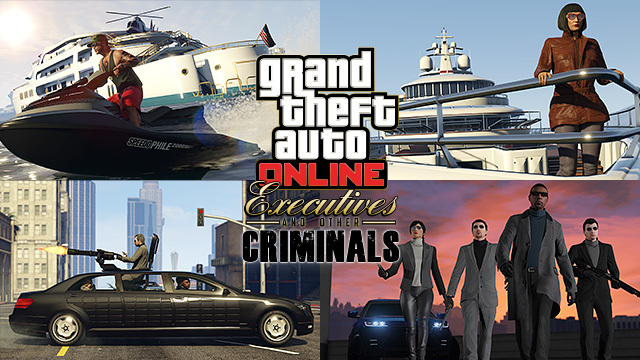 Executives and Other Criminals brings new ways to make crime pay in GTA Online for PlayStation 4, Xbox One and PC - offering players the chance to run their own criminal organizations, hire and fire other players, and face off against rival operations across Freemode. Los Santos living also gets a premium upgrade with the introduction of Stilt Houses for sale in the Vinewood Hills, new Eclipse Penthouse Apartments with customizable interior styles and the debut of the upgradable and fully staffed Super Yachts now for sale on Docktease. The update also comes with new armored vehicles, two new weapons and much more. Players with more than GTA$1M cash in their Maze bank account can choose to become a VIP with the ability to create and name their own organization, and hire up to 3 other players to serve as Bodyguards. All players will have access to the new SecuroServ menu in the Player Interaction Menu to become a VIP and build their organization. Players looking to join an organization as Bodyguards can look out for invites on the new SecuroServ app on the phone and can set their status as "looking for work" via the SecuroServ menu. 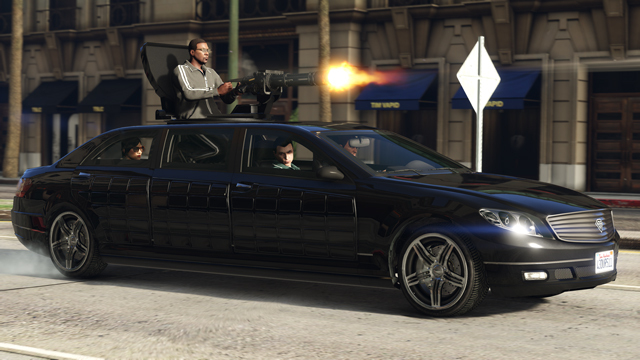 VIPs can drop ammo and armor for members of the Organization, as well as order new vehicles on-demand including the new Turreted Limo, and call-in favors like Ghost Organization to temporarily remove the entire organization from the radar. Joining an Organization as a Bodyguard has the advantage of delivering a periodic salary of GTA$5,000, as well as bringing in additional cash and RP for taking on VIP Work and VIP Challenges that occur within Freemode. However, any cash winnings earned by an employed Bodyguard while not working for the Organization (such as completing Freemode Events or other Freemode activities like Bounties or Hold Ups) goes to the VIP. Bodyguards also enjoy additional benefits including accelerated health regeneration, frequent RP bonuses and stat boosts when in the vicinity of the VIP. VIP Work is the name for 6 new game types that operate directly within Freemode. In Hostile Takeover, an unknown package is held within a restricted area, and organizations compete to collect the package and deliver it to a set location. Sounds deceptively simple, but when the "package" is a tank held inside Fort Zancudo, things get tricky fast. Asset Recovery sends your organization to LSPD stations around the city to recover impounded vehicles. It's up to your outfit to free up those assets and return them to a designated location, while the cops and other players in the session will be looking to destroy your vehicles. Piracy Prevention is attack and defense on the decks of a luxurious Super Yacht. 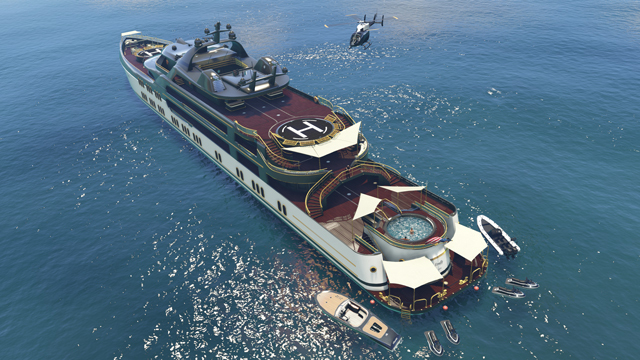 Defending players spawn on the yacht while attacking players spawn on shore with access to boats, helis and Seasharks ready to head out and capture the upper deck. Executive Deathmatch puts rival organizations in a Deathmatch-style battle inside of Freemode, with each VIP allotted just 10 lives. Most Wanted: The heat is right around the corner, with all players in the organization hit with a 5-star wanted level. With a countdown of 10 minutes, the last player alive wins the challenge. Market Manipulation: All open convenience stores are blipped on the map. Players have to race from store to store in a hold-up spree to collect as much money as possible. When time counts down, the player with the most money wins. 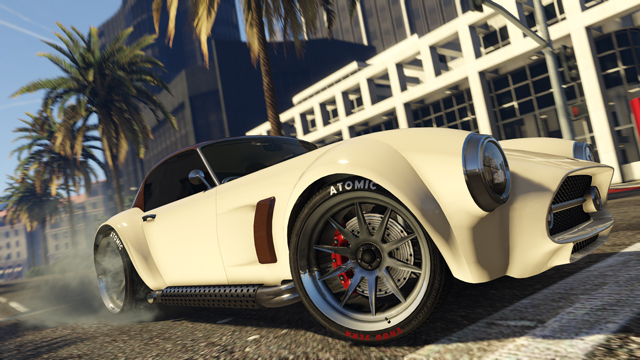 Auto Buyout: Players must steal and deliver as many vehicles as they can. Every vehicle has a specific value displayed when you enter the vehicle, so choose your acquisitions carefully. The player with the highest total value of vehicles delivered at the end of the timer wins. For the ultimate room with a view, players will have the option to purchase a single Super Yacht from the Docktease website. Yachts function as floating apartments and come fully staffed with your own personal captain to shift the boat between your choice of 12 scenic mooring locations around Los Santos and Blaine County, and a bartender to serve drinks for you and your guests. Choose from a range of designs, with higher-end yachts featuring hot tubs, and additional complimentary transport options including helicopters and personal watercraft. Name your vessel and personalize it with a custom flag, hull color and a variety of lighting options. 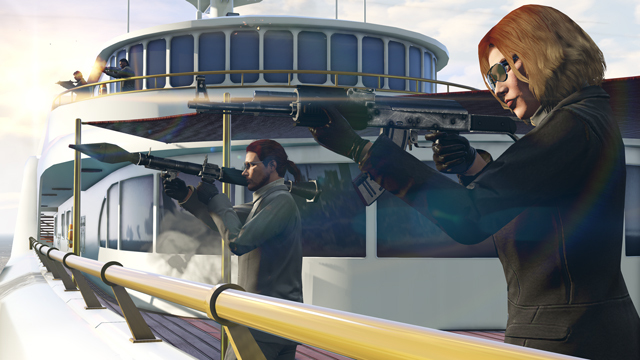 Each Yacht comes equipped with an anti-air defense system to help protect against unwanted attacks from rival Organizations and other Freemode attackers. Executives and Other Criminals also brings the new Adversary Mode - Extraction. Teams of Bodyguards must search, locate and safely extract an Executive Target from their downed jet before a rival Hit Squad intercepts and eliminates the target. You can now take a mugshot or selfie of your character and use it as your Social Club Avatar. In addition to photos of your GTA Online character, this also works with characters from Story Mode, and any mugshots or selfies in your Snapmatic gallery you've taken should already exist as option under Snapmatic Selfies and Mugshots in your Social Club Avatar Settings. Photos created prior to May 2015 may not appear, and photos with meme text will not appear as options. 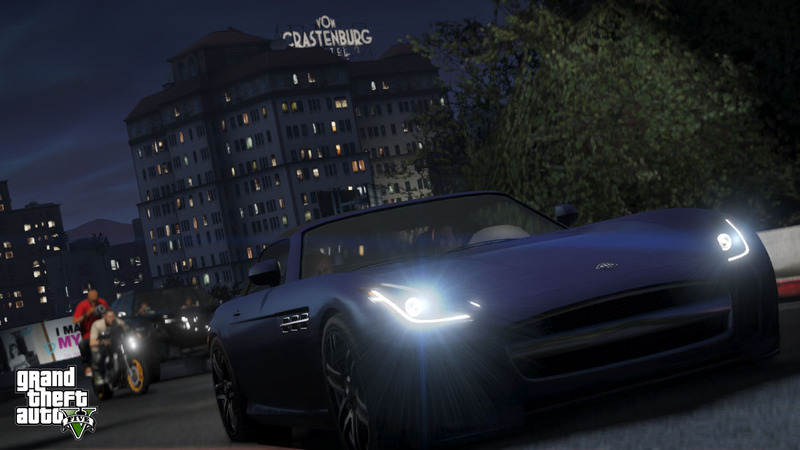 The Art & Downloads section of the GTAV website has also been updated with the latest artwork from Executives and Other Criminals - in a range of desktop wallpaper, background and avatar sizes. Hot damn! Enjoy and recruit some bodyguards in the forums! Executives and Other Criminals Now Available - The latest DLC for new-gen GTA Online, Executives and Other Criminals, is now available.